Neat Nook Creations: Beary special day bear gift tag. Today, the My Creative Time team is sharing Tag It Tuesday projects. Sentiment: Have a beary special day. 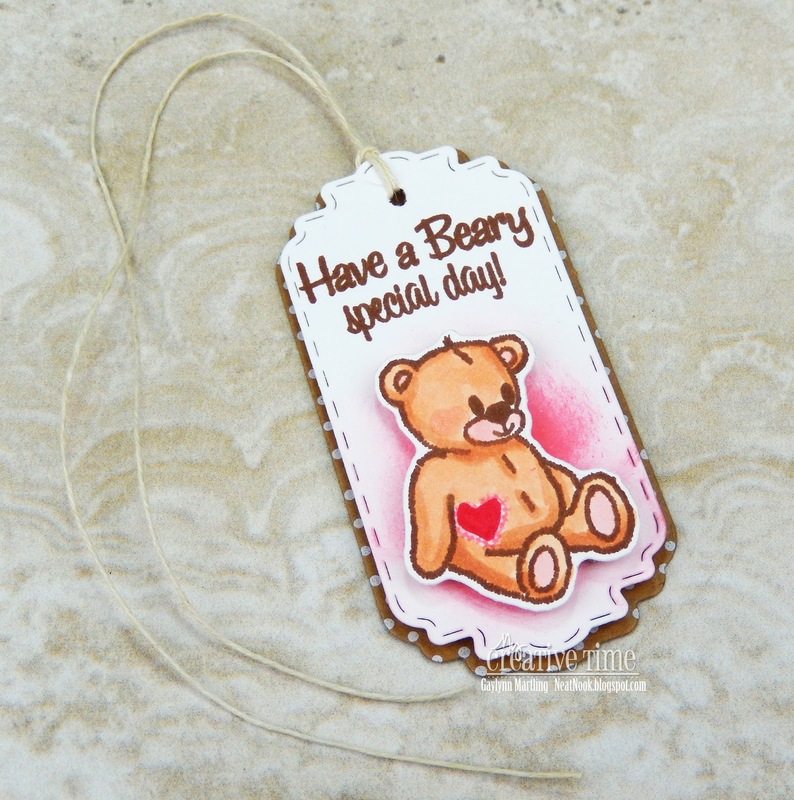 Here is a sweet bear gift tag. It features a teddy bear with a heart. I layered it on polka dot kraft color cardstock. This is accented with a hint of pink peeking through the background. This one is going to be used for a birthday occasion. Supplies: My Creative Time Beary Special Thoughts Stamp and Die Set and Celebration Tags; Big Shot, DCWV paper, twine, Ranger archival ink in coffee and distress ink in worn lipstick; makeup brush, Copic markers R20, E11, E13, RV29. AWWWWE How super Adorable and Precious is your Tag!! You sure did a BEARY Impeccable coloring!! I love how your tag has that Shabby Chic Vintage feel about it *which is a fav of mine*.. I am a polka dot gal so definitely love that too....You did a Super Incredible Creative job!! YOU SO ROCK!! Adorable tag! I like the inking to ground the sweet bear.